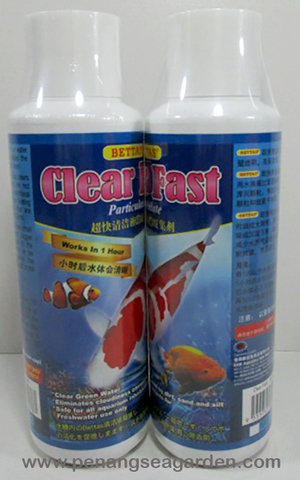 Clear Fast is a water purifying liquid that makes the water clean and crystal clean. Clear Fast also clears organic materials that are not filtrated using conventional filters. It also removes floating particles and bacteria that are harmful to the fish and plants. Clear Fast allows small particles to form into bigger particles that can sink to the bottom of the aquarium or be filtered. Effectively cleans the water it make it safe and crystal clear.